Turtle Beach is a work in progress. It has taken on a life of its own. The manifestation of a dream, to leave the hustle and bustle of a stress driven life and create a place where family and friends can enjoy a piece of paradise! We have a small complex of Villas and Cabins. Location is everything! And we have the best. We are located between West Bay Beach and West End. Water taxis are easy to get and walking is about 15 minutes each way, a private location close to the best Roatan has to offer. From night life to beautiful beachfront walks. Perfect location. Beautiful white sandy beach & crystal clear blue water. The reef is right out front for great snorkel and dive adventures. Our secluded and desirable location consists of 5 Villas, 2 Suites, 2 Cabins and an adorable 3-bedroom house. There’s no traffic here, because we are situated on a quiet dead-end street where the only noise you will ever hear are the sounds of exotic birds and nature at its very best. This mini tranquil paradise is exactly half way between West End & West Bay Beach where you can enjoy local shopping, bars and restaurants and local entertainment that’s largely operated by the islands most friendly locals. English is widely spoken here and there is never a problem when communicating with the locals. Honduras used to be a British colony and the vast majority of locals love to speak English with the tourists. Because Turtle Beach is in the most picturesque location of all the beaches in Roatan — (This is not a complete sentence.) 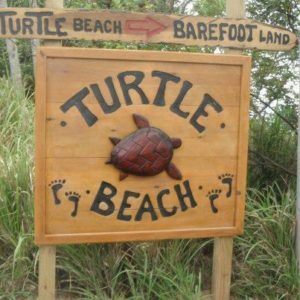 Our beach is groomed every day and you can enjoy our kayaks, hammocks and relaxing lounge chairs solely for Turtle Beach guests. For your convenience, we have free Wi-Fi so you can stay connected if you really want to. The National Park is a truly amazing 3-minute beachfront walk away with zip lines, monkeys, iguanas, macaws, butterfly & hummingbird gardens and caves where you can learn about the history of the Island. 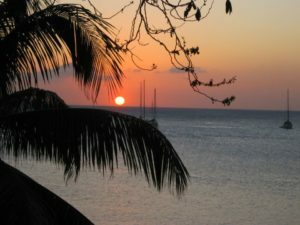 It’s a must to see while you are here in Roatan. 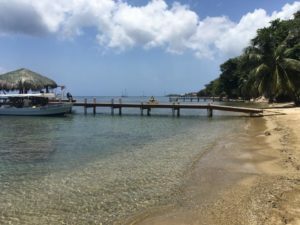 Roatan has some of the best diving experience in the world with beautiful reefs where you can enjoy this wonderful experience when swimming and snorkeling right here in front of Turtle Beach resort. You don’t have to go far to enjoy the experience of seeing all kinds of fish, lobster and even eagle rays can be found for you to enjoy. The Beach front walk to West End or West Bay Beach is about a 3-minute water taxi that comes along all the time or you can take a casual 15-minute walk either way. The great things are that Turtle Beach is conveniently located at the halfway point between these locations. For everyone’s convenience the Dive Shop and all other water sport activities will pick you up right at our private dock. Our dock is reserved exclusively for Turtle Beach guests and provides a relaxing all-points view of the surrounding tranquil life style. We have a full Western Exposure so the panoramic sunsets are dramatic and different every night. These spectacular views (and delete) are mesmerizing and never get too old to watch. Our pool has an ocean front view so you can sip a drink while relaxing in the warm inviting water sipping that cocktail while watching the wonderful sunset. Let’s face it, what more could you ask for? You will not be disappointed here. We have many People leave other places while on the Island and they come here because of the location & all we have to offer. There are no crashing waves because the reef is about a ¼ mile off shore right in front of Turtle Beach. You can Scuba dive, swim with the dolphins, zip Line, do Island tours or my favorite just relax on the beach & swim in the ocean. As you saw on VRBO and TripAdvisor our reviews are all 5 star; so I am confident you will be happy vacationing here. We have had weddings, family reunions, girl’s trips & birthday parties where the whole group rents the place out for themselves exclusively! Honeymooners love it here as well as it’s a perfect paradise. All our Villas have amazing ocean views full kitchens with stainless steel appliances, tiled bathrooms & hammocks on every porch. 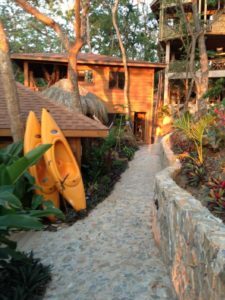 We know you will enjoy every minute of your stay here because everyone that has visited our resort departs sighting wonderful reviews and claims of looking forward to their return. We love our guests and it is our aim to please everyone that comes here for a vacation experience that will be remembered until your next visit. Because we know that we will see you again, (and delete) all our guests are treated like family. So come and visit and become a member of our Turtle Beach Family. We look forward to your stay with us here at Turtle Beach.